It is so frustrating to view audio files with random filenames that you may want to rename mp3 files in one folder with meaningful and identifiable title. As it is known to many people, audio files, especially music and songs, contain a lot of tags, such as title, artist/author, album and date. One of the most useful benefits is that we can extract those tags if the original titles are lost. In this article, you will learn how to batch rename audio files from tags. Audio files converted from CD are named with characters and numbers. Music files downloaded from internet contain extra information on filename. File recovery succeeds but with altered filename. A huge amount of audio files needs to be renamed. As a matter of fact, Windows computer allows users to rename audio files and even edit their tags, but it is a tedious manual work that no one likes. Therefore, it is suggested make full use of free utilities to do it automatically. MusicBee is a freeware media player for playback and organization of audio files on Windows computer. It is capable to do many things, but here we use it as a free mp3 file renamer and automatic tag editor. 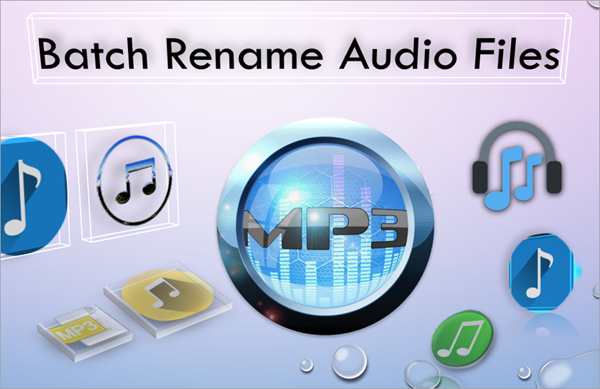 Support MP3, AAC, M4A, MPC, OGG, FLAC, APE, WMA, WAV, MIDI, MOD, UMX, XM, etc. Access to audio files from local disk, external drive as well as iTunes and Windows Media Player library. Edit existing tags and search for matched metadata from online sources (mainly for music). Auto-tag is available for use. Batch rename audio files with custom title formula. 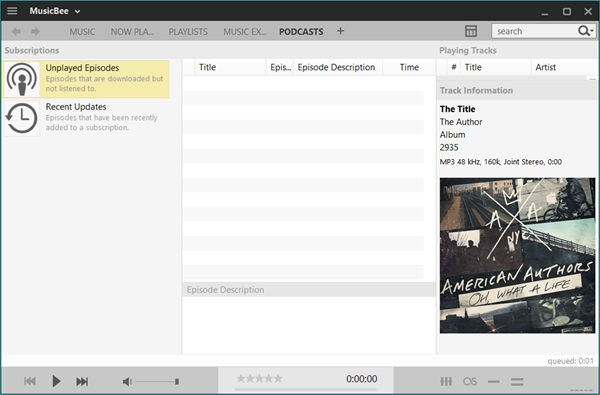 After installing MusicBee to your computer, you can run it like you do to other programs on Windows. On MusicBee interface, there are several tabs opened by default with + icon at the right. The + icon allows users to create a new tab, and then browse files on the left pane. 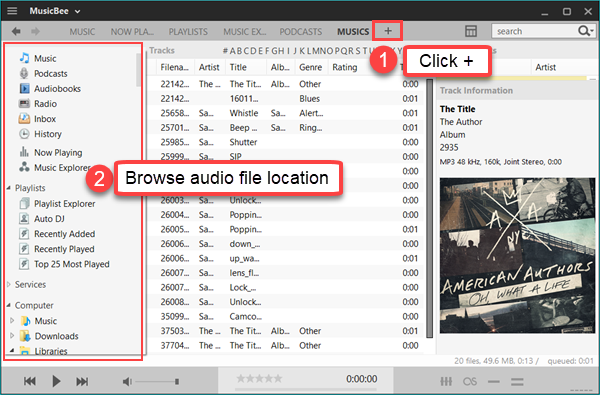 Just select the folder that directly containing your audio files, and then they will appear on the right pane automatically. 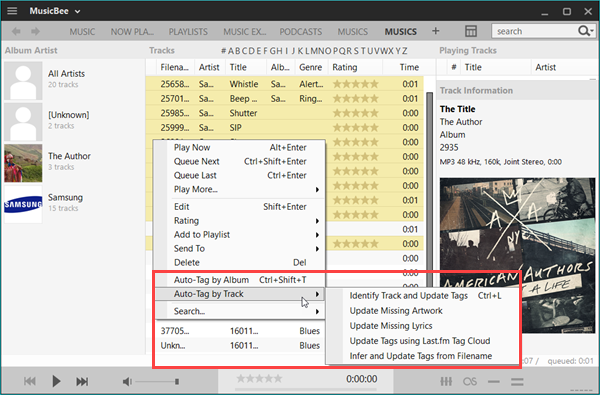 Note: If you just want to rename audio files with existing tags, please skip this step. Select all audio files in the folder and right click, then you’ll be shown with two Auto-tag options. Choose Auto-tag by album or by track according to your needs, then click Find > Apply Tags on the new window. Once they are properly tagged, you can start renaming audio files in bulk. Right click over any track and choose Edit. A new pane will appear on the lower half of interface. Select all the needed audio files, then click the inverted triangle icon on edit pane and choose Rename File. On new window, set the path, naming template and other options. Click Proceed to start renaming. It is suggested choose only fields that are complete in most files as naming template. Otherwise, you will find marks, like #, on the new filenames. Once the process is finished, you’ll be able to check the renamed audio files in the folder you have set. By default, each file is stored in sub-folder separately. You may still need to spend some time organize them well, but the hardest part has been finished. In case you lose some audio files, or even album covers, you can try the best Photo Recovery Software to get them back.